Rich Sausage Rigatoni – Truly Scrumptious (serves 4) | Crappy Kitchen - Good Dinners! This dish should not be overlooked! If you are on the hunt for a dish that packs boatloads of sumptuous flavor with a minimum of ingredients and effort then your search is over. I am transported to a little Osteria in Tuscany by just looking at the picture below! It is so rustic and has that quintessential Italian peasant food feel; robusto! This dish is another great example of me butchering a recipe to suit my needs and tastes. It is from Mario Batali who was undoubtedly inspired by some dish or other he tried in some hole-in-the-wall jewel in Italy. My irreverence for his recipe doesn’t spring from the fact that I think I can do it better. I am so grateful for his prodding my imagination when my mind was blank. I constantly make decisions as I cook, and if I don’t have something, or want to add something, I just go ahead and do it. If you cook as much as I do you learn that most dishes are variations on some sort of standard that can be endlessly changed. The key elements in this dish was the combination of sausage and heavy-duty tomato paste which clung like a magnet to the pasta. That is something I didn’t mess with. I did however change the quantity of milk, used red instead of white wine, added garlic and thinned out the dish with hot pasta water, oh, and changed the bucatini-style pasta in favor of a textured rigatoni and chopped a little fresh basil as a garnish (just because I had it! ); Splendid! I couldn’t believe how good this tasted and was so relived that I had documented this recipe so I can make it again and again. 1 – Put pasta water on for rigatoni and put large saute pan (big enough to hold the complete dish) on medium heat. Add the oil and butter. 2 – When it has melted add the onions and garlic and cook for about 6 or so minutes, stirring frequently. 3 – Add the sausage meat by pulling off with your hands or with a scissors into little chunks. Turn the heat up near high when it begins to release its fat. 4 – Cook, stirring frequently for about 10 minutes or until sausage begins to get nice and brown. 5 – Add the tomato paste and cook for another 6 to 8 minutes (again stirring frequently), before adding the red wine. Lower heat if necessary. Cook for another 2 minutes or until wine has mostly evaporated. 6 – Add the milk and stir. Turn heat down to low and cover with a lid for about 10 minutes. Stir occasionally. Turn heat off if cooked before the pasta. 7 – Add the drained pasta directly into the sauce – DO NOT RINSE with cold water. MAKE SURE TO RESERVE 1 CUP OF PASTA WATER! 8 – Stir the pasta into the sauce and add some or all of the pasta water if you want a “looser” sauce. Serve in warm shallow dishes with fresh basil (optional) and/or freshly grated Parmigiano Reggiano (also optional). Or, gild the lily with a grating of Parmigiano Reggiano! 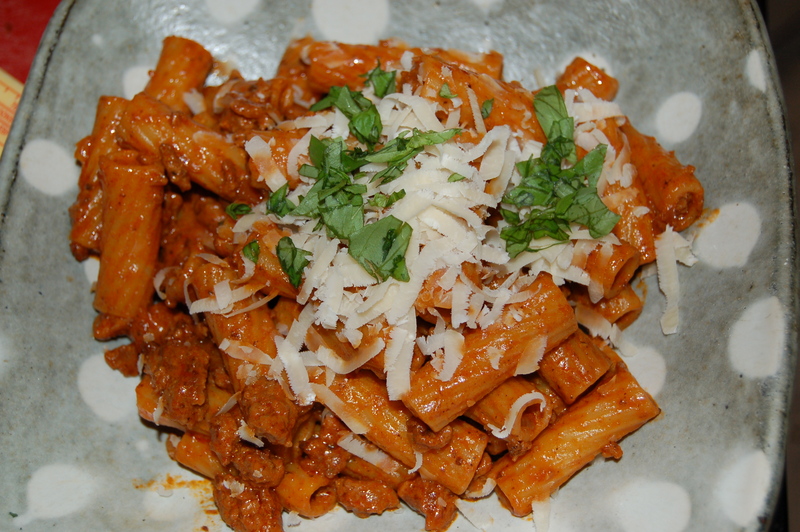 This entry was posted in dinners and tagged easy pasta dinner, fresh basil, italian sausage, mario batali, mild italian sausages, osteria, Parmigiano Reggiano, pasta and basil, ragu, rich ragu, Rigatoni, rigatoni and sausage dish, rigatoni with ragu, sausage ragu. Bookmark the permalink.